/ Modified apr 13, 2016 12:31 p.m. Fare enforcers check one in five, find 99.96% have paid, well above national average. What is the first thing you are supposed to do when boarding the streetcar? Validate a ticket by tapping it on the card reader. If you have taken a ride though, you might have noticed there is no one to make sure that is actually happening. Still, most passengers do pay for their rides, said Marwan al-Mukhtar, who works with Sunlink. 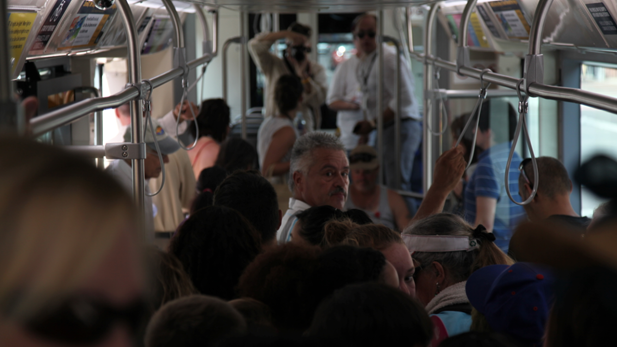 Les than 1 percent, 0.04 percent, of the passengers who fare enforcers approach are riding without a valid ticket. "The national average varies between 2 percent and 1.5 percent and we are well below that," said al-Mukhtar. Why are Tucsonans doing so much better? Al-Mukhtar said it is probably because most streetcar riders are students at the university. "They have discounted fares," he said. "And the students have been very good with tapping and keeping their smart card up to date." He said people caught without paying are given a warning and their names go on a fare-evaders list. Repeat offenders are slapped with fines that range from $100 up to $2,500.